Hello Friends! This week I am featuring another guest blogger, Jennifer Buell. When Jen and I met at the She Speaks Conference in North Carolina, she shared with me that she had recently lost her husband and has since been writing about how God has carried her and her four children through their grief. God’s faithfulness is written all over her stories, and his Hope shines through her. 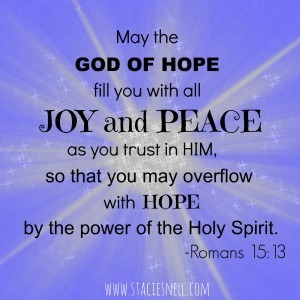 Stepping into the new year with great expectancy for what God is going to accomplish in and through our lives this year, I pray that He fills you with hope, joy, and peace as you read Jen’s post. The words “Happy New Year” seemed to mock me last night. Sorrow wrapped its cold fingers around my heart even as I sat snuggled with my youngest child on the couch watching “Horton Hears a Who” and listening to her laughter. I usually love New Year’s. The idea of flipping a page on a calendar holds such potential. Before you stretches 12 empty months, ready to be filled with adventures and activities, struggles and victories, memories and the mundane. This year the thought of flipping that page brought to mind staring into a long, dark, empty hallway with nothing specific to anticipate. This is not me. This is not the way I view the future. But last night the grief of my second New Year’s Eve without my husband of 20 years was heavy. He died almost 16 months ago. In that time I’ve lived with joy and we—my four kids and I—have kept moving forward by the grace of God. Grief has not been the boss of me. It has not dictated my course nor determined my days. It has been my temporary traveling companion and not in quite a while. So why were the tears so near the surface tonight? Why had pessimism painted my view of tomorrow? Before bed I cruised Facebook and discovered an assignment long forgotten in my messages. 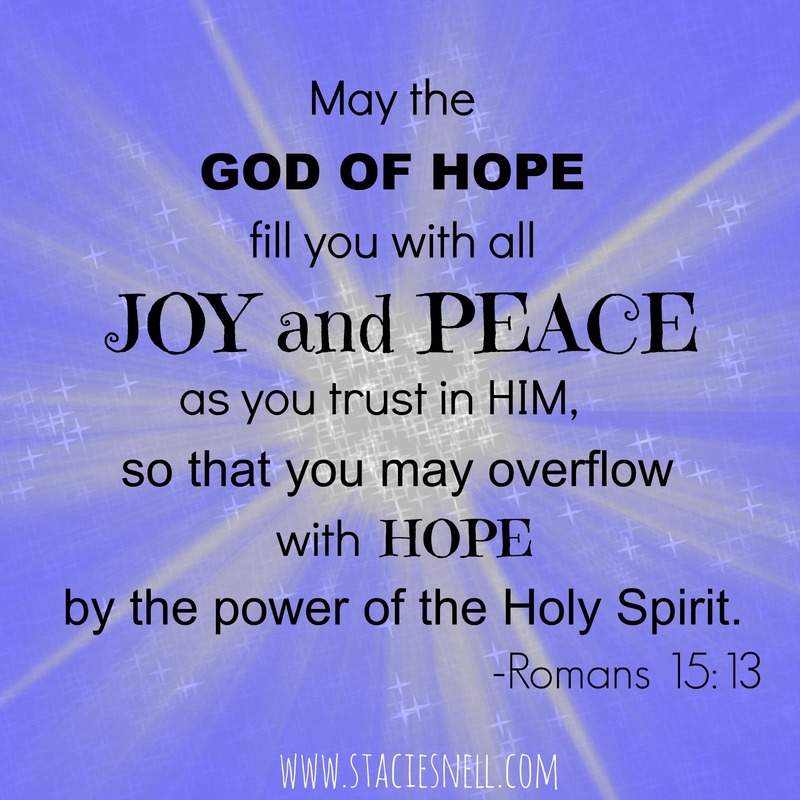 I had agreed to guest blog for my sweet friend, Stacie, over two months ago! I was mortified. I quickly sent her a note apologizing and asking if she still wanted me to write something. That realization was an act of God. In the morning, Stacie replied with grace and gentleness that she was fine either way and understood. For some reason I poured out my sorrow to her and the reply was nothing short of amazing. Stacie went to the Father of Hope for me in prayer. She offered to bring me to Jesus when I couldn’t stand on my own like the friends of the paralyzed man. Her prayers and support lifted the heaviness of my day. This sweet friend shined Jesus to me today. I say friend and am amazed at the truth in that word. Stacie and I have known each other since July and really, the friendship is based on maybe 7 hours together total. We attended the She Speaks Conference and began a relationship of encouraging one another in our writing and God’s call on our lives. She lives in Colorado, I in South Dakota. And so, I come back to the original topic she suggested months ago because after her prayer, I could see it clearly. Stacie asked if could write about how I’ve seen that God is who He says He is. Immediately I knew—He is Faithful! Since my husband died I have seen Him prove his Faithfulness to me time and again. He has provided for this pastor’s widow and her four children in financial ways that astound me daily. He has provided for practical things we need miraculously. He has guided me to a new church committed to showing people who Jesus is—including supporting widows. He has provided friends to walk with me, cry with me, and as Stacie reminded me, not be bothered when I need to say I’m sad. He has been faithful to send His people to surround me in prayer when I can’t lift my head. Sitting here over a year after his death, the thing that brings me to tears is telling of God’s amazing faithfulness. This journey has been long but I have not walked one step of it alone. Jesus has been right here and His people have stood with me in astounding ways. So today I will wrap up this guest blog with encouragement for anyone not excited that today is January 1st. You may be feeling the weight of grief today and that is OK. You may be struggling with something that makes the months ahead seem dark. Remember that God has promised to be faithful to care for us, provide for us, strengthen and uphold us. He is faithful! I can shout that from the rooftops and when I do the light of truth and hope shines onto that calendar again. When you submit this coming year to Him, He can and will do amazing things. I just needed a friend to carry my weary heart to Jesus for a moment so that I could see it.